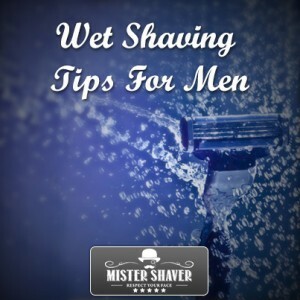 Wet shaving is not as difficult as it seems, but it can be a challenge for beginners. Once you have a clear understanding of how to proceed, you’ll be having the smoothest shaves just like your grandpa! A traditional wet shaving requires that you have certain shaving supplies before you can begin. These things mainly include a safety razor, a shaving brush, and some shaving soap. The preparations prior to a wet shave hold a great importance. Sadly, a lot of people simply skim through the pre-shave; perhaps because they are unaware of its importance for a good shave. The purpose of a wet towel is to soften the facial hair while opening the pores of the skin. The towel should be large enough to cover your face – excluding the eyes. The easiest way to warm up a towel is by putting under a faucet of running hot water. Let it sit for a while until it gets warm enough and then cover your face with it for several minutes. A minute or two would do the trick. You may already have done this as per the instructions above; however, if you haven’t, now is the good time to apply those hot towels for 3-4 minutes to get your face ready for the shave. When using a shaving cream, you will need to use a shaving brush to create a rich lather. Create a rich lather onto your face by performing a number of strokes using the shaving brush. Now comes the actual part of shaving. Start off by applying very little pressure and let the blade do the rest of the job. To reduce the chances of any nicks, cuts or ingrown hairs – shave with the grain of your skin. Applying less pressure will also save you from irritation and burning. If you feel you need to shave a second time; do so by applying another layer of rich lather. Do make sure you rinse your blade at regular intervals. Once you’ve finished shaving, rinse your face with cold water, followed by some kind of an aftershave balm. Read on to find out what types of aftershave skin care options you have to keep your skin feeling fresh and healthy. Lotion. Aftershave lotions are usually alcohol based and are known to heal razor burns. However, they can cause dryness of the skin. Milk. Aftershave milk products are hydrosol-based. This means that they have a milky appearance and generally offer great benefits for the skin. Balm. Aftershave balms are yet another option and are now available in roll-on packaging making application quick and easy.